From manufacture and storage to transport and final disposal, chemicals pose significant hazards in the workplace. The aim of chemical safety is to ensure that any work involving chemicals is carried out so that workers, the general public and the environment remain safe. The first step to protect workers is to carry out a risk assessment. This must take into account the duration for which workers will be exposed to the chemical and in what process it will be used, along with properties of the chemical itself. It should also include the environment, for example, a laboratory, factory or a medical facility; whether it will be subject to high temperatures or humidity; and what action to take in an emergency should a chemical spill or toxic powder release. The consequences for workers can be very serious. While some incidents can result in burns, allergic reactions or fatal injury, there is also the problem of long latency diseases caused by exposure. All these tasks require competence. If this is not available in-house, then it may be necessary to seek assistance from qualified specialists. The first step is to identify which chemicals are being used. If a substance is dangerous, the supplier will provide a safety data sheet when the product is first ordered or if the formulation changes. Even if the chemical is not dangerous the supplier should provide instructions for safe use. It is important to note the occupational exposure limit (OEL). The ILO maintains an online database of OELs, which contains links to standards in many countries. The most used limits, called threshold limit values (TLVs), are those issued in the United States of America by the American Conference of Governmental Industrial Hygienists (ACGIH). Another useful source of information are the International Chemical Safety Cards (ICSCs). These summarise essential safety and health information on chemical substances and are intended for use at the shop-floor level by workers and occupational safety and health (OSH) practitioners. There are more than 1,600 ICSCs available free of charge in 18 languages. The International Chemical Control Toolkit is useful for small and medium enterprises (SMEs), in particular in countries where it is difficult to get access to people who specialise in the control of chemicals. It uses an approach called control banding and focuses on exposure controls. Each chemical is assigned to a hazard group and depending on the category a control strategy is recommended. Another source of help is available from the UK Health and Safety Executive (HSE) chemicals webpage. Since 2007, the Registration, Evaluation, Authorisation and restriction of Chemicals (REACH) system has been used to control chemicals in the European Union. REACH builds on the safety data sheet and aims to ensure that information is passed on from the supplier to user and vice versa in a structured way. OELs are usually expressed as time-weighted average concentrations over an eight or 12-hour shift and sometimes include short-term peak concentrations. It is not practical to measure the concentration of pollutants everywhere in the factory, so usually a number of representative samples are taken and the average concentration is estimated. This concentration is then compared to the OEL. Sampling can be carried out at fixed sites and can also include the personal breathing zone of the workers. The results may need to be analysed unless self reading instruments are used. It should be noted, however, that OELs are based on a 70 kg North American male worker and levels may need to be adjusted if the workforce is female or Asian, as their body weights will generally be lower. It is also important to remember that if more than one chemical is being used this may present a greater hazard. OELs are therefore not definitive and need interpretation, taking into account the situation in which they are being used. The evaluation of pollution levels and workers’ exposure is a specialist task and should be carried out or interpreted by a competent person with experience in industrial hygiene. When the risk assessment is complete, it is important to establish controls. A risk assessment should identify the need for personal protective equipment (PPE) such as coveralls, gloves, masks and any specialist PPE. Before relying on PPE, it is important to think about how the use of chemicals could be eliminated or reduced. Having identified chemicals, can you stop using or producing the chemicals that cause problems? Are there safer alternatives to the chemicals used? If so, substitute the safer chemical for the more hazardous one. If a significant risk remains, consider how the chemical can be isolated. Enclosing a process that uses dangerous chemicals is a more effective safeguard than expecting every person who walks through an area to wear personal protection. Contaminants from the enclosed area must be safely ventilated. Where the work area cannot be completely enclosed, can you reduce the number of people exposed and the amount of time for which they’re exposed? Where some workers are still exposed, ventilation needs to be provided. Enclosures and ventilation systems must be maintained and checked to make sure they’re working effectively. Can a process be changed so that the worker does not come into contact with the chemical? Could an automatic parts dipper be used on a vapour degreaser, for example, rather than dipping parts into the tank by hand? Care should also be taken in developing cleaning procedures so that cleaners aren’t exposed to chemicals more than necessary. Only when everything has been done to eliminate or reduce the hazard through substitution, isolation and ventilation should PPE be considered. The aim of PPE is to shield or isolate individuals from chemical hazards. The type of PPE will depend on the type of hazard, for example, skin burns or irritation, chemical splashes or inhalation hazards and the type of protection required. Examples of the type of PPE that may be needed include coveralls, head protection, masks, gloves, goggles, foot and leg protection, eye wash stations and emergency showers for use in the case of an accident. Companies have a duty to inform workers of all the known occupational hazards they may encounter in their work and what measures they need to take to stay safe. They need to provide workers where necessary with ‘suitable’ protective equipment and clothing and provide first aid and access to medical help in an emergency. • Where and when is PPE needed? • What type of PPE will be required? For example, is a greater level of respiratory protection than skin protection needed? • Who is able to supply it? • How should it be worn and adjusted? • How it should be maintained? • How long will it last and how should we dispose of it? Deciding on ‘suitable’ PPE can be complicated and it is recommended that companies seek advice from the supplier or manufacturer. It is important that companies do not automatically select the cheapest equipment as this could be sub-standard and may not offer the protection promised. It’s important to consider the worker, the task and the environment when selecting gloves or footwear. Be aware that a CE marking and chemical protective pictogram does not automatically mean that a glove will provide protection against all chemicals - it just means that the gloves have met a minimum European standard. It is important to remember that no glove or boot will protect against all substances, so it’s essential to choose a glove or protective boot that protects against the particular chemical being used. If gloves are to be worn for a long period of time then comfort is very important, as otherwise the user may be tempted to remove them. Good fit is vital as gloves that are too tight will be very uncomfortable, while those that are too loose can make carrying out a task difficult. Equally, safety boots must be a comfortable fit. If a chemical is spilled, the feet and legs of the worker are vulnerable. The aim of protective footwear is to prevent the chemical from reaching the skin, so the footwear chosen must be suitable for the task. It is good practice to involve the user in the selection of gloves and footwear and give them a choice of products if possible. Protective coveralls are categorised depending on the level of protection they give the user. To summarise, types 1 and 2 suits provide the most complete protection and are fully sealed and incorporate breathing apparatus. They are used in very hazardous environments. Types 3 and 4 have sealed seams and are made from chemically resistant material. Type 5 suits provide protection against aerosols and dusts. Type 6 suits protect against occasional splashes of low toxic liquids. The selection of a coverall, therefore, will depend on the task and the environment. Again, good fit is important, as working in a tight suit could mean that the level of protection is reduced because of the strain on the material. Donning and doffing the suit correctly is important. Donning should be preferably carried out in a contamination free room. The coverall should be put on before footwear to prevent damage to the coverall. A different room should be used for doffing. If there is a high level of contamination it may be necessary to decontaminate the suit, boots and gloves by spraying them with water before they are removed. Suits should be handled by the inside surface to prevent contamination of the skin. It may be necessary for another worker dressed in protective clothing to assist in the process. Any contaminated items should be disposed of in a chemical waste container. This doffing room will then need cleaning. Companies need to establish a system of maintaining protective clothing to include cleaning, examination, testing, repairs and replacement. There should also be suitable storage facilities. If an accident happens and a worker is contaminated by chemicals then an emergency safety shower, or eye or face wash unit will provide essential first aid. The stations must be easily accessible - the recommended standard is that it can be reached in 10 seconds. This will mean that there is little delay in providing treatment to either alleviate the problem or prevent a serious injury getting worse. Good maintenance of these stations is essential. A shower will not be used regularly, but should be tested and run each week and disinfected to prevent the build-up of legionella. The water should not be too cold as this could increase the level of shock to the casualty. An emergency shower should deliver 20 gallons (75 litres) of water per minute for 15 minutes. The shower head can be mounted on the ceiling or wall or it can be a free standing unit, depending on the space available. 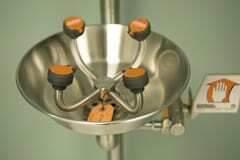 Casualties must be able to take off their contaminated clothing without the shower being interrupted, so the shower controls must be easy to operate, for example ‘walk on’ foot controls or a lever. Eye and face wash units can use a system where they are triggered by a foot control or any way that quickly activates the unit and leaves the hands free to hold the eyes open. It is important to keep access to these units free of obstacles, as the casualty may have impaired vision as a result of their accident. It’s important to train workers not only in how to wear the PPE but how to look after it, as if it is badly maintained it will not provide sufficient protection. It needs to be cleaned and stored correctly after each use. For breathing apparatus it is essential to check the flow rate and air pressure of the air supply at the beginning and end of each shift. Strict personal hygiene must always be observed so as to prevent local irritations or the absorption of chemicals through the skin. It is important to assess a worker’s health before they start a potentially hazardous job. A suitably qualified health professional can help you decide how often the worker should be reassessed. Records should be kept of all assessments, along with a description of the work undertaken. If health problems are identified through regular checks, or if workers report symptoms between tests, action may be needed to remove the worker from the job until a further assessment is made. Monitoring is about measuring to show that controls are adequate. Companies will need to carry out monitoring to demonstrate that PPE is working well. It can also detect where there has been contamination. It should be performed and assessed by trained and experienced people, in accordance with recognised and scientifically accepted methods. Active monitoring provides feedback on performance before an accident or incident, whereas reactive monitoring involves identifying and reporting on incidents to check the controls in place are adequate, to identify weaknesses or gaps in control systems and to learn from mistakes. Companies should not rely on failure data to monitor performance. The consequence of this approach is that improvements or changes are only determined after something has gone wrong. Setting leading indicators is better. These can identify failings in vital aspects of the risk control system discovered during routine checks on the operation of a critical activity. Leading indicators require a routine systematic check that key actions or activities are undertaken as intended. They can be considered as measures of process or inputs essential to deliver the desired safety outcome. An example of a leading indicator could be the percentage of maintenance actions identified that are completed within specified timescales. When working with chemicals, it is essential to have an emergency plan. This plan should cover all eventualities, but also be easy to follow. The results of monitoring and auditing will highlight areas to be covered in the plan. It is important to think of a worst case scenario, but then focus on trying to prevent it rather than planning for it to happen. Develop emergency procedures and ensure that they are achievable. Train workers so they know what to do in an emergency and carry out drills so that if the worst does happen, there is no delay in implementing the procedure. It’s important to review plans regularly. Working with chemicals can be a risky occupation, but with good risk assessment carried out by competent staff and adequate control measures including the provision of appropriate PPE, workers should remain safe. Focusing on prevention and using leading indicators may mean that you may never need your emergency plans.